I was up to watch the 50-milers take off down the trail at 6 AM, and the 30 milers at 7 AM, followed by the BC judging for the 100-miler. Gabrielle Mann and Big Easy, Jennifer Neihaus and MC Gallantly, and Michelle Roush's horse PR Tallymark showed for BC. Michelle was riding another horse in today's 50, so her friend showed Tallymark. Afterwards, I was visiting fellow Idahoasters Nance and Bruce Worman in their horse trailer out in the suburbs of packed ridecamp - their trailer and my tent were on the far end of the meadow. 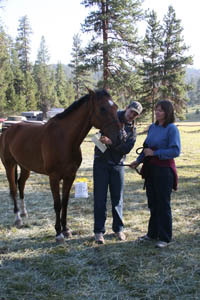 Nance and her horse Big Sky Quinn finished the 80 miler last night. While sipping our Starbucks coffee, a woman came up to the trailer out of breath saying something about, "There's a horse in a manger, Bruce can you come? Bring all your tools!" ? We weren't quite sure what she meant, and didn't think much of it, but Bruce said, "OK, sure," and off they went. After another leisurely cup of coffee, Nance and I walked to downtown ridecamp where the awards meeting was going to be held. There seemed to be a lot of horse trailers in the single lane road through camp, and I started to notice that they were all parked, motors turned off, and the line started behind a 2-horse trailer where a lot of people were crowded around. At the same time the question of whatever could that lady have meant by, a "horse stuck in a manger" popped in my head, and it dawned on me that everything was related. I looked closer at the first trailer and couldn't believe what I thought I saw - the hind end of a horse - looking very shortened in the 2-horse trailer. A yet closer look revealed the front end of the horse was indeed in the manger and wrapped around the dividing pole. When somebody says "A horse is in a manger," that's what they mean! I couldn't watch anymore. It had already been discovered that nobody had a Sawzall, and many people had scrambled around for whatever tools they could find, and put their brains together as to how to get this horse out of her predicament. She had apparently reared up in the trailer on their way out of camp, gotten her front feet up on the manger which had collapsed, and now her front end was stuck in there, no way to get herself out. She'd been in there 45 minutes by the time Nance and I arrived. 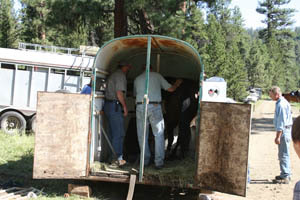 Dr Robert Washington tranquilized the mare more than once while he and Dennis Tribby and Bruce Worman and others worked on breaking the trailer apart, with sledgehammer and hacksaw, and a tow cable attached to the center divider bar of the trailer. I'd hung way back - couldn't bear to watch - when Nance came up and said "You should get pictures of this!" I just couldn't do it, so I sent her up there with my camera. In the end, another half hour later, everything had turned out fine (I should have had faith in everybody); the manger was carefully and successfully pulled apart enough to step the mare's front end out from the manger, and she was carefully backed out of the trailer. And best of all, the equation of Trapped Horse + Tight Space resulted in no human getting hurt. The mare ended up with only a few cuts on a hind stifle, and a deeper cut over her eye... and she got a ride home later in another trailer. It's a happy ending to a lesson we can all learn from: inspect your trailers! For wear and tear, rusted parts, rotted floorboards. And all those other things you won't think of till it's too late. 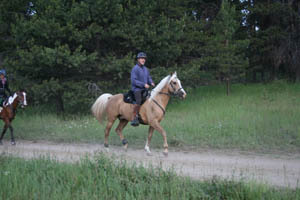 Meanwhile, there were a couple of rides going on, with another 60 or so horses out on the trails. It was cooler today, reaching only around 80* at the hottest part of the day, and much cooler towards evening. 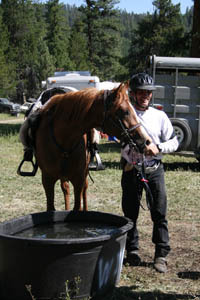 Adam Falke could finally ease up on re-filling water troughs, which he'd been doing constantly since oh, about Thursday, in camp and out on the trails, and at the one out vet-check on the 30-mile loop. Troy Tribby won the 50; Christopher Wood won the 2-day 100 on his big Arab-Morgan Palomino. One of the finishers in the 50 was Tinker Hart, from Minden, Nevada, who also rode yesterday. "On Friday I thought riding 80 miles on Saturday, and 50 miles on Sunday sounded great. The last 10 miles today, I wasn't so sure." Dr Chris Kane was a veterinarian yesterday, and a rider today, doing the 50 on her Paso Fino Paint. She took it slow, and one of the drag riders pulling ribbons from the 10-mile loop came in ahead of her. It was getting awfully close to the 6 PM cut-off time for the 50 when Chris finally rode in to a bunch of Turtle cheers. Turns out the ribbon puller had actually pulled some of the ribbons from Chris' trail, so she'd lost her way coming in. Our watches all said 5:59 PM when Chris finally crossed the finish line! All 23 riders finished the 30 mile ride. Led by Melissa Queen, the first three finishers were Ride and Tiers, doing just the riding but not the tie-ing today. 25 of the 28 starters finished the 50, and PR Tallymark won Best Condition in the 100. A fine conclusion to the day was the big vat of jambalaya that Paul cooked up for everybody to go with the potluck dinner. If you're looking for an excellent ride with exemplary management, good people you want around if anything bad happens (or if it doesn't), perfect weather, wonderful trails, and (equi) ethnic diversity, Bandit Springs is where you want to come. 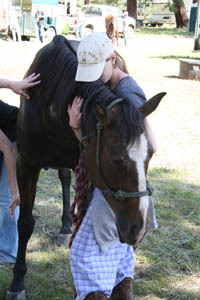 Bring your Arabian, bring your Tennessee Walker; bring your color breed. 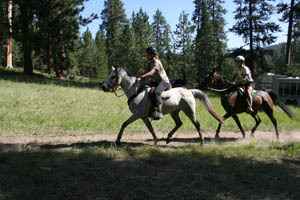 Just bring your horse, and get out on these great trails and ride.